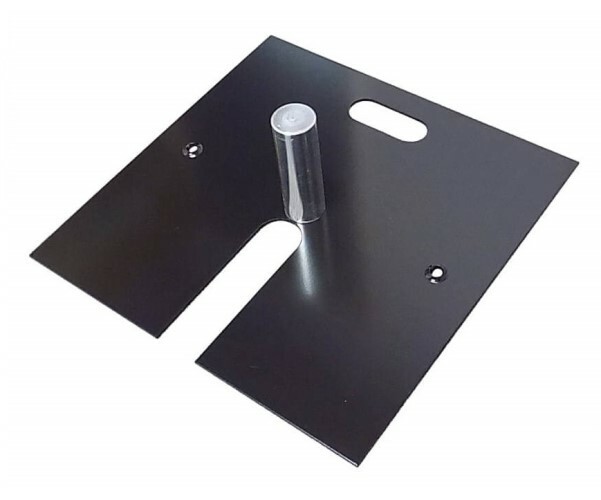 NOTE: THIS BASE IS MEANT FOR USE WITH OUR 10 FOOT FIXED, 10 FOOT BREAK APART, 6-10' ADJUSTABLE, OR 7-12' ADJUSTABLE UPRIGHTS ONLY. Our taller uprights require heavier and larger bases. 18 inch x 18 inch durable steel base with 6 inch tall base pin (for use with 1.5 inch diameter aluminum Uprights). Options for other size base pins are available. U-shaped stacking slot is cut in to one of the 18 inch sides. Also features a convenient carrying handle slot. 3 holes allows you to choose your preferred base pin location. 17 lb. weight is approximate, with included base pin. Very well made, solid construction. Just what we needed. 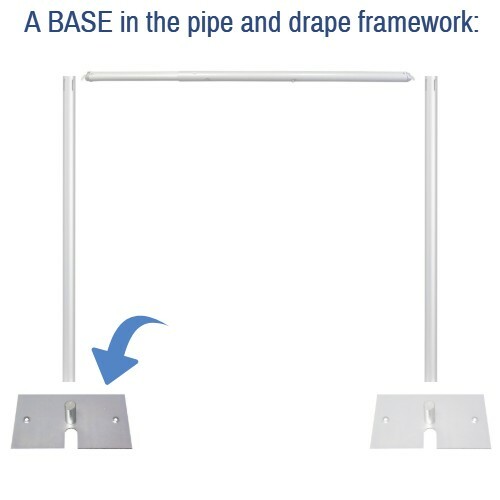 The bases were easy to find on the Pipe & Drape Online website. Following a simple purchasing process, they arrived quickly and look great on our trade show exhibit. Love this base. It is durable, heavy, and looks very nice. The slip fit is so much more convenient that traditional bases. Top notch purchase and you can't beat an online store with helpful staff on the phone when needed. Q: if I'm getting 12ft uprights what pin diameter do i need for my bases? It depends on the Upright diameter that you are going to use with the Base. If you are purchasing 1.5 inch diameter Upright pipes, then you would need to choose the 6'' Tall for 1.5'' Diameter Upright base pin option. 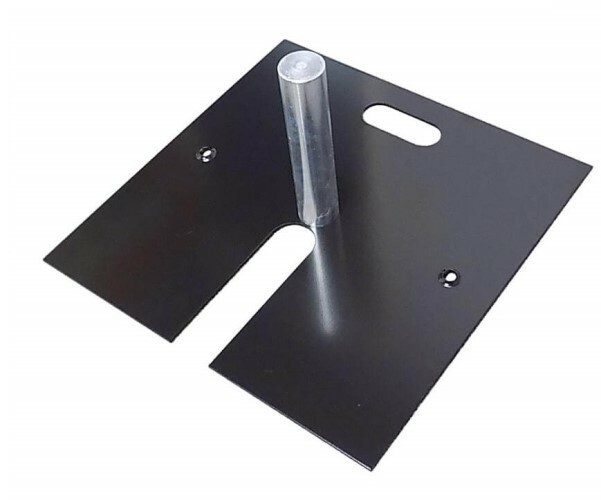 If you are buying 2 inch diameter Uprights, then you could choose either the 6'' Tall for 2'' Diameter Upright or the 9'' Tall for 2'' Diameter Upright base pin option. The 9 inch tall version provides a bit more stability if your pipe and drape system will be used in a high foot traffic area, or if you are going to be using very heavy drapes. Weight (Approximate, Each, with Included Base Pin): 17 lbs. 10 oz.